Creating online courses on your website can be an intimidating task. With lessons to plan, visual, audio and text media to craft as well as checklists and course workbooks to create, there’s a lot to be done before launch day. To do all that, you'll need to focus on creating great content instead of wasting precious time worrying about how it all looks. That's not to say design isn't important, it's just not what you should be spending very much time on. That’s why we just added 14 new content box templates to Thrive Architect’s Styled Box element to help you achieve your course design objectives. This means you can stay laser focused on creating content and rely on our pro design team to help showcase it all. Read on to see what each of these new content box templates look like, what they’re for and how they’ll help you build, ship and sell your online courses in waaay less time. The content box templates showcased in this post are now available to use within any of the Thrive Themes plugins that use the Thrive editor to create content (this includes Thrive Architect itself, Thrive Apprentice, Thrive Leads, Thrive Quiz Builder and Thrive Ultimatum). Drop a Styled Box element from the Thrive Architect sidebar into your editor window. When the content box template window appears, select one of our many, cloud-based content box templates. Scroll through the options to find the template you’d like to use. In the editor window, modify the template’s text, images, colors and links to make it appropriate for the online course lesson you're applying it to. If you make a habit of using professionally designed templates like the ones you’ll find in our Thrive Architect Styled Box feature, your lessons will not only look great, but you’ll finish creating your course in a lot less time. We call this our Rapid Implementation Principle and it’s at the core of how we do business. It explains why we put so much effort into making great templates — for landing pages, opt-in forms and other types of content boxes — readily available to use on your website. With that said, here are our 14 newest content box templates created specifically for helping you build fresh looking online courses super fast. Select the "Course Information Table" option within the Styled Box element to use this template. Although our Thrive Apprentice online course plugin does provide a course overview page for your online students, you may still want to present similar overviews of certain courses on other areas of your site. Whenever you have additional resources, links or content you’d like to include in lessons, the following 5 content box templates will help you do that — each for slightly different purposes. Select the "Related Resource Box" option within the Styled Box element to use this template. This content box template is a simple design you can place at the bottom of your lesson pages. 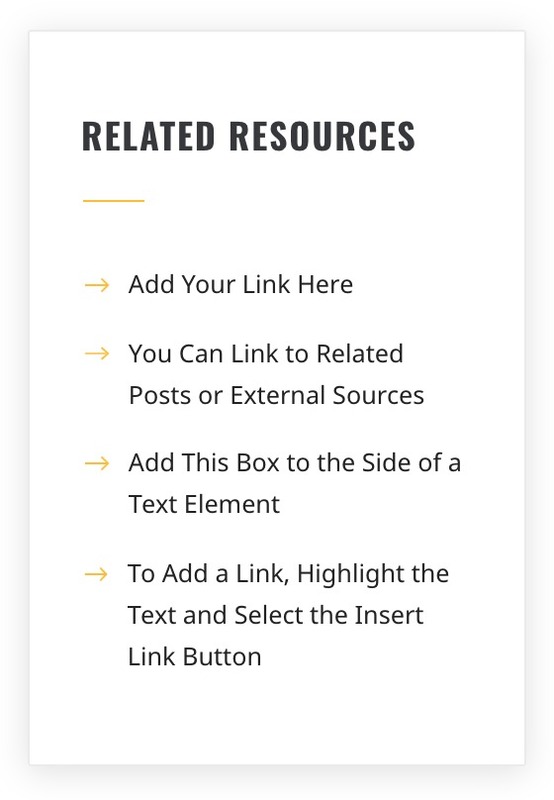 Putting all your related resource links in a content box like this creates a visual consistency for students to look for at the end of each lesson. Select the "Skill Box" option within the Styled Box element to use this template. This is a more complex additional reference template that organizes your resource links by either subject matter or skill level. We created it with the Tabs element within Thrive Architect and assigned a category to each tab. Select the "Quick Links Box" option within the Styled Box element to use this template. Did you know that the Thrive Architect editor allows you to turn entire content boxes into clickable links? To do this, you simply select the content box element you want to modify and add a URL in the Action & Animation tab found in the editor’s left sidebar. 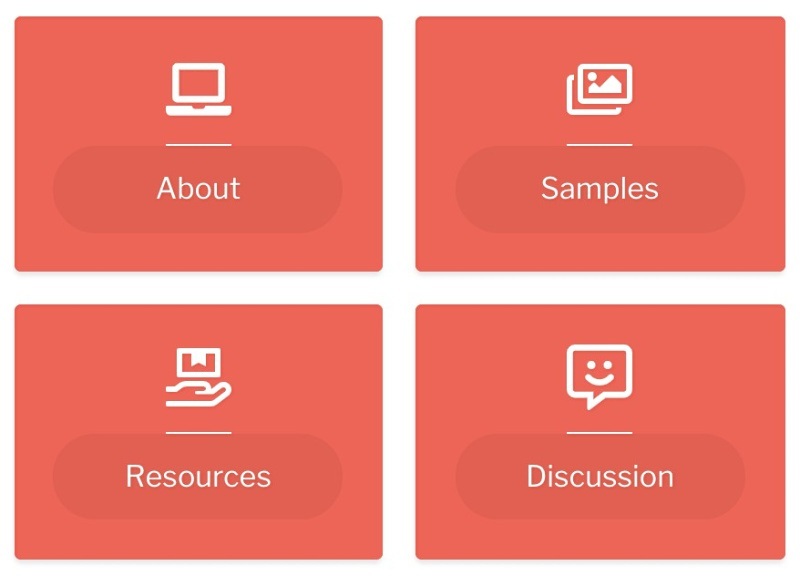 We designed this content box template with icons and text elements to make it easy for students to understand what they’re clicking on with just a quick glance. The hover animations look pretty cool too. Select the "Download Boxes" option within the Styled Box element to use this template. Download boxes are a great way to deliver additional course content like audio files, video files, images and PDFs to your students at the end of different lessons. Use this template on any lesson page where your students need to download media files to complete the lesson or take their learning offline. Select the "Fancy Resource Boxes" option within the Styled Box element to use this template. This resource box template design puts a professional touch on the lesson extras strategy by embedding buttons within dressed up content boxes. Select the "FAQ Box" option within the Styled Box element to use this template. Frequently Asked Question boxes are a great way to not only answer your most common course or specific lesson questions, but locate them in easy to find spots for your students. The Thrive Architect Toggle element is perfect for creating FAQ sections on either your course lesson pages, overview pages or landing pages. The questions are shown on top of each toggle element and the answers reveal themselves in drop-down fashion after clicking. Heading off your most common student questions via FAQ content boxes will also eliminate the amount of time you’ll spend responding to student questions since they’ll already be front and center on key pages of your course. Select the "Pop Quiz Box" option within the Styled Box element to use this template. Quizzes are a great way to test your students' understanding of course material at the end of certain lessons. 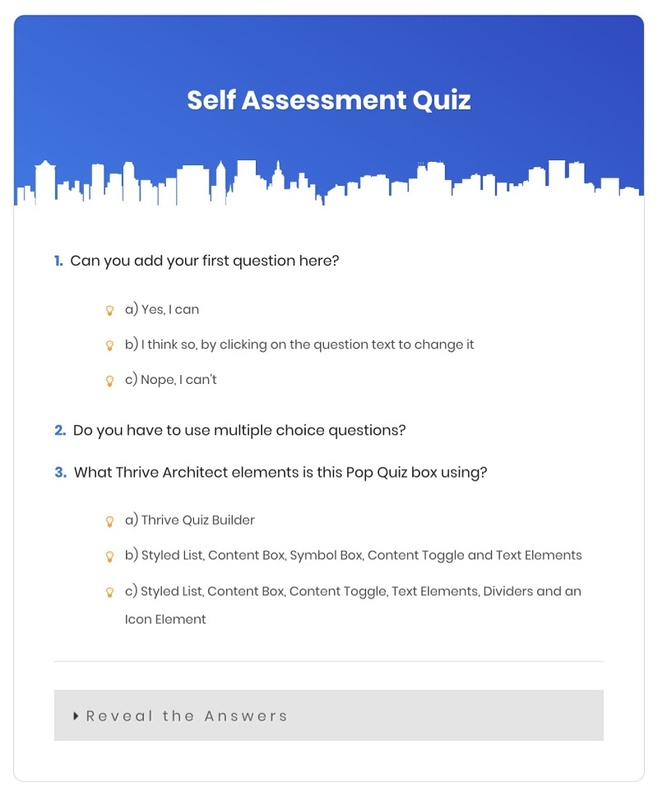 The following content box template makes inserting self-assessment quizzes into course lessons super easy and simple by combining the functionality of Thrive Architect's Paragraph and Toggle elements. Just modify the template text to add your quiz questions and then use the Toggle element to reveal the answer. Using this content box template to add self-assessment quizzes to your courses is a sweet hack since it means you don’t need to buy or program additional tools to get it done. However, if you do want your lessons to have more interactive quiz capabilities, you can always insert quizzes you create in Thrive Quiz Builder by using shortcodes to accomplish that. 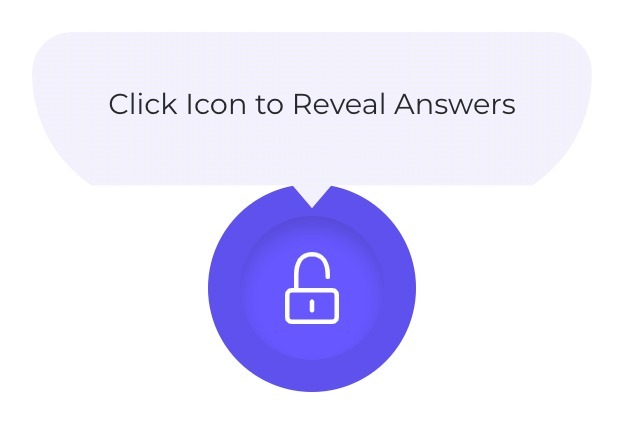 Select the "Answer Reveal Box" option within the Styled Box element to use this template. Another cool way to add quizzes to your course lessons is by using the Thrive Lightbox feature available in Thrive Architect. The way to do this is by creating Thrive Lightboxes in your WordPress dashboard (a feature that comes with the Thrive Architect plugin) for the purpose of revealing the answers to lesson quizzes. Note that the content box template we created for this is not the lightbox. You’ll have to create that on your own (check out Example #5 in this blog post to learn how). The template provided here is just a good looking content box that includes a button you'll set up to reveal the appropriate answer lightbox when clicked. Select the "Exciting Download Button" option within the Styled Box element to use this template. Another way to get your students interested to download extra lesson content is with an Exciting Download Button. Just drop this content box template into any of your course lessons and modify the title, image and asset delivery URL to make it useful for your specific needs. Select the "Download List Box" option within the Styled Box element to use this template. If you have a list of different downloadables for a given lesson, this content box template is just what you need. 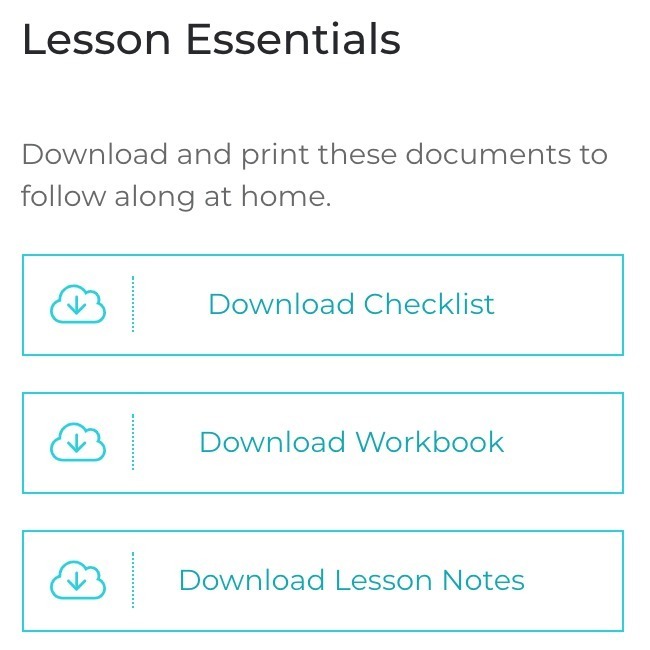 To modify this template for your lesson pages, simply update the text to match the description your downloadable(s) — like PDF checklists, workbooks, lesson notes, or audio files — as well as the digital delivery URL links for each button. Select the "Fancy Step-by-Step Boxes" option within the Styled Box element to use this template. If you’re attempting to teach a step-by-step skill or process in one of your course lessons, the following content box template will make explaining how to do that look great. It’s designed to numerically guide students from the first to last step with step titles, tutorial images, and step descriptions. You can add all sorts of Thrive Architect elements to help you explain each step like Styled Lists, Progress Bars, and Videos too. Just modify the text and replace the elements with your own media and you’ll have a step-by-step lesson ready to publish in no time. Select the "Simple Step-by-Step Boxes" option within the Styled Box element to use this template. If you’d rather use a more minimalist, text-only design for your step-by-step lessons, select this simple step-by-step layout instead. This content box template is great for basic lessons that don’t need a lot of visual media to explain how to do certain things. Select the "Buy this Course Promotion" option within the Styled Box element to use this template. Whether you’ve created free or premium online courses for your website, it’s always a good idea to promote them wherever it’s relevant to do so. If you're selling an information product, use this promotional template on your sales page, blog posts or inside one of your free online courses to attract new customers into your sales funnel. Alternatively, you can modify this template to promote your free online courses on blog posts or lead generation pages to turn more visitors into subscribers. Don’t forget that after you modify the template to suit your needs, you can also save it as a Symbol to give it global editing functionality. 14 new content box templates available in Thrive Architect and Thrive Apprentice you can use right now to help craft your online courses. Simply insert a Styled Box element within any Thrive editor window and select the template you're after to start building lessons in a fraction of the time. We’d love to hear what you think of the new content box templates as well as any other ideas you have for design object templates. P.S. If you already have a Thrive Themes Membership, you can now build and sell online courses on your website using our Thrive Apprentice plugin integrated with a tool called SendOwl. We just published a new course in Thrive University showing How You Can Build an Information Product Empire Using the Thrive Apprentice + SendOwl combo. The course is available to anyone who registers for our free Thrive University subscription, but you'll need to sign up for a Thrive Themes Membership to get access to Thrive Apprentice until we start selling it publicly sometime in 2019. Some great additions. I had noticed some of them in the ‘Online Course Design Templates’ section of the ‘members only content’. Any chance that you or a member of the team can produce a video tutorial on how to use these content box templates in Thrive Apprentice to create a lesson? A visual demonstration of the full process is worth 10,000 words. Glad you like the new “Styled Box” content templates Jonah! Your video tutorial suggestion would be a great piece of instructional content for creating Thrive Apprentice lessons so I think you can expect to see that sometime soon! Some really nice boxes! But will the Apprentice plugin stay for members only or are you going to release it for non-members too? I’m a Thrive member and not an employee but i can say that Thrive Apprentice is being released outside of membership in 2019. Grab it because it is cool and continues to be improved upon, which is always good. Yes, Thrive Apprentice will be available as a separate plugin, but not until 2019. One of the Thrive Membership benefits is that we make our new plugins exclusive to members only for awhile before we release them publicly as single-license products. But yes, you can expect to Thrive Apprentice to be available on its own in a few months. Matt, awesome post. Is this the membership solution you were referring to a couple of weeks ago or is Thrive going to incorporate their own membership solution outside on sendowl? Thanks. Hi Shawn, the deep SendOwl integration is the membership solution I was hinting at a few weeks ago. Thrive Themes is not working on a membership plugin tool at this time. FWIW…I’m “just” a Thrive customer, not an employee, but I highly recommend getting the Thrive Membership! IMO, it’s the BEST value in the entire WordPress eco-system…and I have been using WP exclusively for 9+ years! Thrive really takes cares of their Members and continually updates their products based on ongoing customer feedback. thanks, I’ve seen that they released TP in the meantime. Indeed, the membership is the best value + option in the long run. me parece util estas plantillas prediseñadas para web de cursos presenciales o en linea , en la caja de estilos tambien esta una plantilla de precios, pero no funciona al dar clicks para que cambie las diferentes en instancias en celulares, unicamente funciona en computadoras de escritorio. ¿Con qué tabla de precios tiene problemas de respuesta móvil? Great stuff! These will be super valuable in my blog posts too. Thanks Peti… very good point! Good to see you in the neighborhood, Barney! I look forward to trying the step-by-step boxes in a blog post. Thanks for these. You’re welcome Bakari… I hope they’re just what you need! These boxes are brilliant! I was working on adding elements like this to my site last night so your timing is perfect. Thanks a million ???? Glad they were so useful for you! Great design and a great help for us to focus on content. Thank you, Matt. I´m looking forward to the webinar replay. I´ll check it out later today in the member´s area. The Thrive Apprentice + SendOwl integration webinar replay is now available as a free online course in Thrive University. Just login to Thrive University and you can get started with it here. I am not exactly ready for the developing my courses yet, but to have this option when I am is very cool. I did look at other options and other services and Shane made the point you stop paying and you lose access to your content. So they have you hostage. I like it when I am in control of my content. Love just love Thrive. Thanks Darin! We definitely agree that it’s best to own your content on your own platform so you don’t get held hostage by the priorities of another business. Glad you like them Ilka! Really like the style boxes. I hope more templates created, and then you maybe do a few video tutorials about how to create styles boxes. Thanks. 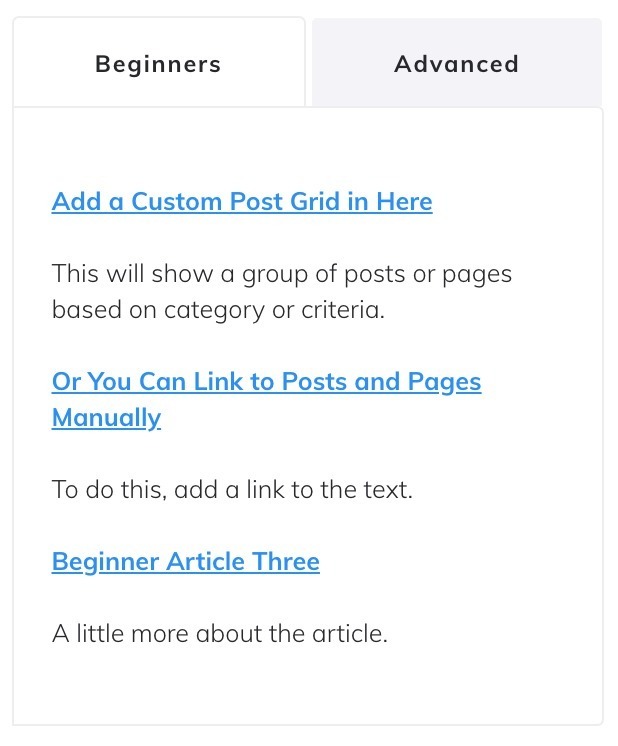 Nice rapid implementation of the step-by-step content box template on one of your blog posts Bakari! To create the circles, insert a “Paragraph” element, set the Padding to 14 px on all sides, set the Background Color to whatever you want your highlight color to be, Borders to white and 5 px, Rounding to 90+ px, and a white Inner Shadow to a 1 px spread. The vertical lines are just empty Content Box elements with a grey, 1 px wide, right side Border. You can look forward to more “Styled Box” content templates and video tutorials coming soon! Matt, thanks for the post. I like your style. I am putting together my 2nd course. The first was on Thinkific’s platform. I want to use Thrive Architect, and will check out SendOwl. I am also awaitiing an update to Thrive Apprentice that should improve its ability. Thank you. Cheers Jeff! Make sure to check out our new Thrive Apprentice + SendOwl integration Thrive University course to see if it answers your questions about changing platforms. Can we use these in Thrive Apprentice itself? Is Thrive Architect integrated with Apprentice? Yup, you build your Thrive Apprentice lessons with the same Thrive Architect User Interface Martin. If I want to change the font for the answers, it shows “oxygen”. By clicking on the “edit-pencil” I’m able to chose a different font. However, as soon as I close the edit opiton and save, “oxygen” comes back. Do I do sth. wrong or can’t the fonts be changed in the FAQ Styled Box? You can definitely change your font types within the Toggle elements in Thrive Architect. Make sure to type in the Google font type you’re looking for, click on it in the drop down options that appear, and then click apply. These content box templates are amazing. You made the whole process of setting up an online course so much easier. Glad you found them so quick and helpful to use to build your online course lessons Barbara! Some great extras here giving me plenty of ideas (and work) on how to enhance the experience for my customers. Not just for courses but for “regular” blog posts too. The related resources template would be good to use for related blog posts too, on occasions, increasing internal linking and potentially sales. Thanks Matt! Great point David! 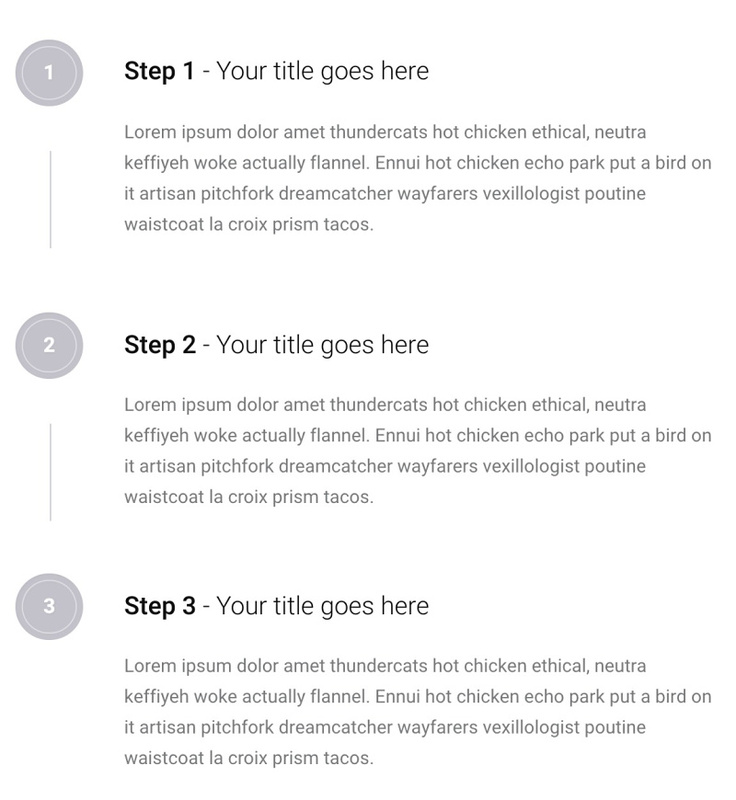 Yes, I also think many of these content box templates would work well for blog post use cases too. Hi. Thank you for the templates. I have watched the course “University showing How You Can Build an Information Product Empire Using the Thrive Apprentice + SendOwl combo”. But could you verify the 2 video lessons? I think that the two videos are exactly the same. Thanks for your comment Rosinaldo. I made the webinar replay video available on both of the video lessons for the viewer’s convenience so you could have it playing no matter which lesson page you were on. WOW, Awesome post. Thank you so much for share your useful article. hi Matt, I love these templates and will use them on online courses form my clients. I don’t use apprentice though, as with apprentice all these courses look alike and my clients want to stand out. So… I build them in thrive architect. One thing I miss really hard are the horizontal menu’s. I used them on all my clients courses and my own to build an overview of lessons in one module on the side. Now I can’t anymore and I am looking for solutions. Any suggestions?